C’est vrai! J’aime les bonbons! But these are not just any bonbons, these are nostalgic bonbons. They bring me back to the only other time I’ve ever encountered these chewy, sweet, tart, bundles of goodness…high school French class. Once a year, students taking French sold Eiffel Bonbons to raise funds for the program. These little guys were like crack! Buzz would start circulating weeks before the fundraiser even started and once it was underway, they would sell out real fast. 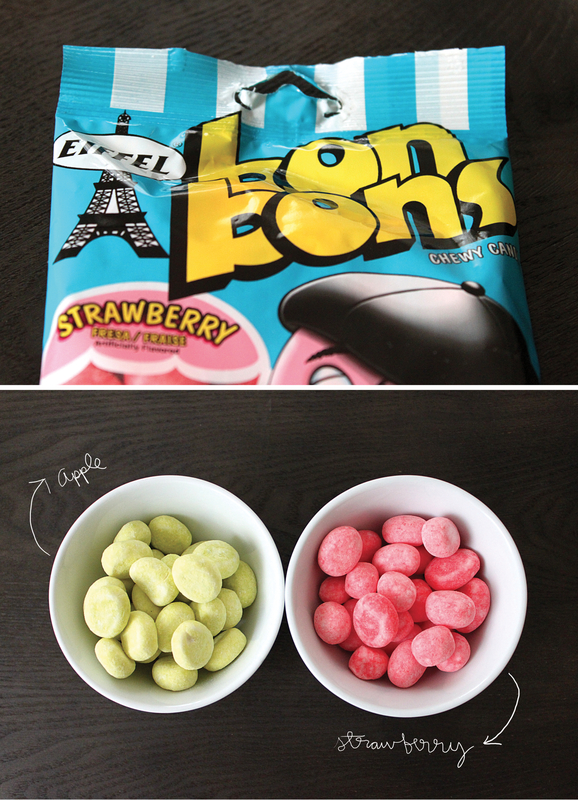 At that time, Bonbons weren’t sold in stores, or at least I was never able to find them…and believe me, I tried! Nowadays, you can buy bulk boxes at online candy shops like this one, but I’d have to be a real bonbon crack head to buy a box of 24! I just can’t justify purchasing that much candy at once. So, when I was ogling the amazing candy isle at Cost Plus World Market the other day, I literally gasped aloud when I saw my beloved Eiffel Bonbons and immediately proceeded to buy as many bags as I could carry. I was just like…well…a kid in a candy store! Is anyone else familiar with these? I think they were (and maybe still are) a common French class/club fundraising candy. If you’re curious, head on over to Cost Plus and taste them for yourself. xoxo! How funny! I don’t think my high school French class ever hosted a fund raiser. I know I would have loved selling sour bon bons. I am a sour candy nut! Oh, these are wonderful! I actually found authentic bonbons in France last summer, they were sold in large glass jars by weight but tasted just like Eiffel ones from high school. I was ecstatic! If you can get your hands on a pack, try ’em! p.s. loved your interview on Lark & Linen!